It's a South East Asian thing. They have this obsession that players are never fit enough and the answer is more stamina work. It's a refrain I have heard many times over the years, usually from foreign players more used to relaxed regimes where they use that round thing. Not here. Gruelling multi kilometre runs are the norm followed by training! Days off after a game? Fooorget it. Sweat some more. The new coach at Tampines Rovers has now gone down this route. He has decided, with just about three months left of the season that his players need to work on their fitness! Sam Allardyce and Tony Pulis would never get jobs in this part of the world. They are far too advanced for these dinosaurs! Should be sweat down an old pros cleavage though for the likes of Mustafic Fahruddin and Noh Alam Shah who both spent time in Indonesia. Chonburi enter the month of September with one of the busiest fixture schedules of recent years. You know what? It would be a nice gesture from the TPL if they moved the Osotspa back 24 hours. You know, to allow the team an extra 24 hours to recuperate after a bloody long flight and 90 minutes arguing with biased refs. But won't happen. Not in Thailand where tail wags dog. Bloody hell, when was the last time this happened? I recall Persib playing Selangor a couple of years back at the Shah Alam Stadium but that sticks in the memory 'cos it is the only one! Arema IPL are looking at playing a series of friendlies in Singapore! No dates have yet been announced but the games will have too take place before Arema take on Al Ettifaq in the AFC Cup quarter finals. Proposed opponents are SAFFC, Home United and Young Lions. I personally think they should squeeze in a game against Tampines Rovers! Any Aremania planning to head over?! Diego Michiels was one of the handful of players brought over by the Indonesian Football Association (PSSI) to add some zest to what had become a predictable national team. With an Indonesian father, Michiels was eligible and to press his claims he gave up his career in the Netherlands, where he played for Go Ahead Eagles, and was snapped up by Pelita Jaya. The 22 year old left back made an immediate impression in the 2011 SEA Games when Indonesia just lost out to Malaysia on penalties in the final. But Michiels performances impressed many and, unlike Kim Jeffrey Kurinawan and Irfan Bachdim before him who were both brought over from Europe to play in the national team, Michiels had attitude which many related to. Unfortunately he was soon unwittingly caught up in the imbroglio that continues to harm Indonesian football. Pelita Jaya, the club he had signed for, played in the unofficial Indonesia Super League and when the PSSI announced no played in the ISL would be called up for the national team he was in a quandary. Playing for the national team was major motivation for him in taking Indonesian citizenship. After a couple of games he switched clubs, joining Persija in the officially sanctioned Indonesia Premier League. That made him eligible, again, for the national team and with continued good performances for his new club he was called up by the full national team for his debut in a World Cup Qualifier away to Bahrain. It was a debut to forget as Indonesia lost 10-0! With a busy September lined up for the national team, coach Nil Maizar called up the 22 year old for the training camp ahead of the friendlies. But games against the likes of Everton, Galatasaray and Espanyol failed to materialize and in the meantime Michiels had signed for Arema on loan with the aim of playing in their AFC Cup quarter final against Al Ettifaq later in the month. Michiels reportedly quit the training camp to join his new Arema team mates as they prepare for their crucial games later in the month, putting him directly in conflict with the national team who have friendlies that clash with the Arema game. Clearly Michiels has decided to put club before country and Maizar has responded by dropping him from the team. Considering playing for Indonesia was a major motivator, what changed? Where that leaves Michiels is as unclear as where Indonesian football stands. For a young man just wanting to play football, he finds himself caught in the middle of the maelstrom that surrounds the game and is damaging the very assets it is supposed to protect and develop. UPDATE - since I posted this Diego has been on Twitter giving his side of the story. Thai FA chief Worawi Makudi plans to file a countersuit against a South Korean company which is sueing him for fraud. Daihan 21 (now Daihan Yonhap) yesterday filed a lawsuit with the Criminal Court against the Football Association of Thailand and its president Worawi claiming that they tricked the company into joining a business to oversee the commercial and broadcasting rights for the FAT from 2007-2011. The firm claimed it had transferred a total of US$900,000 to an FAT's bank account but the two parties have since failed to give the company the rights. The court set the initial hearing on Nov 12. Worawi said the move was aimed at discrediting his reputation and that he would file his own suit against the company. "Which account? I know nothing about it," Worawi said. "I have been working very hard for Thai football but am still bullied so I have to fight." Meanwhile, Supachai Chaisamut, chairman of the House committee on counter-corruption has asked Worawi to show the committee the FAT's tax payment record. "I will certainly go to see them but I wonder why they ask me to meet them," he said. "This is a matter of the FAT overseeing its commercial rights which has nothing to do with the public sector." COMMENT - what planet do these people live on? This is the guy who offered to support England's world cup bid in return for England playing a friendly in Bangkok then reneging on the offer. PETALING JAYA: Negri Sembilan are hitting top gear and coach Mohd Azraai Khor Abdullah is grinning from ear to ear. The defending champions started off with a lacklustre 1-1 draw with Felda United in their opening Group C match but proved their title aspirations by whipping Sime Darby 4-0 in their second match on Saturday. Negri and Felda are now the front runners to go through to the next round as Perak and Sime Darby FC have only one point each. Azraai, who led Negri to their third Malaysia Cup success last season, said it was still too early to talk about the quarter-finals as they have to beat Perak at the Tuanku Abdul Rahman Stadium in Paroi tonight. “Nothing is assured yet as we need to beat Perak first before thinking about the quarter-finals,” said Azraai. “It will be a tricky match but we need to seal the points. Perak are wounded tigers after having lost their last match. We must maximise our home ground advantage,” said Azraai. Negri’s on-loan midfielder K. Thanaraj will miss the match through suspension after collecting two yellow cards but crowd favourite S. Kunalan will be returning after serving out a two-match ban. Cameroonian striker Jean-Emmanuell Owona, who bagged a hat-trick against Sime Darby, will once again spearhead the attack with on-loan striker Khairul Izuan Abdullah. Azraai believes that if his team follow the game plan, they can retain the Cup. “The team have been playing to instructions and if they continue to do so, it is possible for us to win the Cup again,” said Azraai. SLeague Not Good Enough For Harimau Muda? Isn't spin a wonderful thing? Malaysia's Harimau Muda have mumbled they may withdraw from the SLeague next year as they seek to prepare to hang on to their SEA Games title in Myanmar in late 2013. Their coach has expressed a preference for spending extended time in Slovakia or Brazil and I must say I agree...would love to spend time in either of those places. He hasn't come out and said so explicitly but the inference is that playing Woodlands Wellington ad infinitum isn't the best preparation he feels. The coach also feels that by staying in the SLeague, Singapore especially would have an advantage if they were to meet at the SEA Games as they would know their game so well. If the FA agree to the coach's request then there is a second Harimau Muda team, a younger version, who could still compete in the SLeague. Whether the Singapore Football Association would be receptive to the idea remains to be seen. For now it remains a proposal. Indonesia will not be be facing a European reserve team. The PSSI had recently announced the national team would be playing Espanyol reserves in Jakarta on 5th September in a friendly. When I checked the Espanyol website a few days back there was no mention of this game. Which is odd. You would think them travelling half way round the world for a game of football would have been of interest. Anyway the PSSI later announced Espanyol would not be coming because they had reserve games lined up on 2nd and 9th of September. Now for my twopennyworth. My understanding is that Espanyol are/were keen to come to Indonesia, ostensibly to cash in on the Arthur Irwan connection, but they had not agreed to any date. Perhaps there was some surprise their end when the PSSI announced the game as a done deal. The PSSI have a habit of announcing games only to later sheepishly say they won't happen because the supposed opponent has other commitments. And that is an accusation that can be aimed at both the former and current regimes. A game against the Philippines was similarly announced then pulled. This is where the local media has a role. Instead of just parroting announcements from Senayan they should be working their own sources, FIFA.com springs to mind. Interest is reaching fever pitch levels over who will take the reigns at Arema ISL. One name that looks like he won't be returning for a second stint there is Miroslav Janu who has reportedly signed on with Persela for another season. One name continually linked is Robert Alberts. The Dutch coach is now with Sarawak but remains a contender for a return to Malang where of course he guided Arema to the Indonesia Super League back in 2009/2010. One more name is Milomir Seslija. He has also coached Arema but he was with the IPL version! Another name seemingly thrown in the hat today? Former Mitra Kukar and Philippines coach Simon McMenemy! For me one of the success stories of last season's SLeague was the return of Tanjong Pagar. They officially add United to their name but that's plain daft. United with what? Anyway, they got thumped by all and sundry but they also had a real go at some of the bigger teams and earned themselves a handful of good results with such a young squad. OK, it was 12 games before they got their first win and they only won three games but they did give a good account of themselves. This time round they have already won four games half way through the season. And they have managed just 11 goals this season in their 17 games. But on Friday they travelled to Choa Chu Kang Stadium, a venue where home team SAFFC once went yonks unbeaten, and won 1-0! Yes SAFFC are a pale shadow of those heady days and yes they had Noh Rahman red carded. But it doesn't matter. What matters is Tanjong Pagar earned themselves a famous victory. I bet they thoroughly enjoyed the coach trip back after the game! Vietnam is forever hosting age group competitions; so many I can't keep track of them all. However Indonesia will be competing in one of them! The Thanh Nien Tournament will be held in Gia Lai in October and according to ASEAN Football Indonesia will compete alongside Malaysia, Singapore, Iraq and Syria. I presume the hosts will also be taking part. The Thais have also been invited but not yet replied. It does seem that Thailand, so long the dominant power in the region, have all but give up on international football; a consequence of a popular, and politicaly strong, domestic league. After a month's hiatus, when the League Cup and the League Plate took centre stage, the real action returned to Singapore last night with a couple of games. Leaders Albirex Niigata were held 0-0 by Home United while Balestier Khalsa and Geylang United emulated that score at Toa Payoh. Ties to be played home and away early September. A 15 year-old Malaysian footballer, Sean Gan Giannelli, will join Italian Club Atletico Arezzo's Under-17 team in the Tuscany region on Aug 20 after having impressed the club's coaches and technical staff. Sean, who is of Italian-Malaysian parentage, is a student of Bukit Jalil Sports School and trains and plays with the Under-17 Bukit Jalil squad, the feeder squad of the Malaysian national team. His father, Massimo, told Bernama from Milan that he was proud of his son's progress in the sport as he is the first Malaysian to enter Italy's youth football club system after attending trials in June. "He is a very ambitious young man and his goal in life is to play professional football at the highest level in Europe and from what he has achieved so far, the sky is the limit," he said, adding that he was now making preparations for Sean's stay in Italy. He said Sean, a striker, impressed with his pace and technical skills at Arezzo, a Serie D club now led by head coach Abel Balbo, a former Argentinian national player who had played alongside soccer legend Maradona. Balbo, who had scored 150 goals in Italy's Serie A as a striker, had played with AS Roma, Udinese, Fiorentina, Parma and Boca Juniors. FIFA have actually made a decision. Nope, it's not April Fool's Day. Like much of South East Asia, Thai club Si Sa Ket have been dicking FIFA round for a pretty long time. They were ordered to pay former coach David Booth $225,000 back in February but of course they never bothered. (Complete story can be found here). Now FIFA have decreed Si Sa Ket must pay 483,000 Thai Baht or face being deducted six points. If they fail to pay then the club will be automatically relegated. Good luck to Booth, who is now coaching Phnom Penh Crown, getting his money back. But aren't FIFA's threats all a bit hollow? Do Si Sa Ket even exist anymore? FIFA have shown in the past they are all piss and wind when it comes to South East Asian nations; with the exception of Brueni who they suspended but then they are a tiny country and no one goes there for holidays. The Indonesian FA have been happily ignoring FIFA for several years and the world's governing body have done nothing beyond send some stern letters. What makes anyone think this will be any different? The Malaysia Cup kicks off tonight and LionsX11 are enjoying some positive coverage in the local papers. But it nearly refers to the heady days of 1994. One reason Singapore football struggles to attract interest these days is because many folk are still wrapped in the bubble of '94 and that includes teenagers who were not born yet. Read the papers any day of the week and you see people going on about the good old days, about gentlemen like Fandi Ahmad and about how teams like Pahang and Selangor were put to the sword. With the daftly named LionsX11 playing Johor FC, Harris Harun and co are being reminded of those days. An obvious reaction no doubt but not really the ideal preparation for the Malaysia Super League runners' up. Glory days but for sure but in 2012 football in Singapore is, cue awful cliche, a completely different ball game and alot of interest has waned over the intervening 18 years. The whole island no doubt will be hoping to recapture those heady times but any slip up by the players and we can be sure the vicious attacks won't be slow in coming. Extra pressure that is not really needed? LionsX11 are back in the Malaysia Cup and in their opening group they sure won't be able to complain too much about the travelling with two teams from Johor across the causeway and a team from Selangor up by KL to get past. Ticket prices are more expensive than the recently finished Malaysia Super League. Season tickets are also available for the three group stage games. $38 for the grandstand, $22 for the rest. Given two away games a short drive away it would be good to see many fans ignore the scare stories that fill the papers about their northern neighbours and make the trip. When Raddy Avramovic announced his squad to play Hong Kong in a friendly there were the usual whines in Singapore. Not Duric. Not again. He's too old. Why, they whined, do we have to rely on a 42 year old foreigner? Singapore defeated Hong Kong 2-0 yesterday and both goals were scored by that old man, Duric. That's 25 goals in 47 international appearances. Now I may be now coach but those numbers suggest why he is still Raddy's first choice. Them numbers don't lie. The man keeps himself incredibly fit, rarely misses games through injury. Compare that with Robin van Persie who Manchester United have just spunked 23 million quid on. You can imagine all the Singaporean Man U fans flocking to buy the latest replica shirt and paying to have RVP's name on the back despite the fact he has spent most of his career injured. Yet they complain about someone in their own backyard who keeps himself fit and does the business year in, year out. I'm going to go out on a limb here and suggest that Chantaburi are favourites to get relegated from Division One in Thailand. I know, it's not often I go out on a limb like that but I just get that feeling that their days are numbered in Thailand's second tier. Never seen them play so can't say I have any special insight. Let's just call it intuition. It helps that the league table shows they are bottom of the table with just two points from their first 22 games of the season. Enough to put them 13 points behind the team just above them, Raj Pracha. Their points have come from their home games where they have a pretty impressive record, drawing two and losing just nine times. They have also rattled in eight of their fourteen goals at home which suggests an intimidating fortress over there towards the Cambodian border. Not sure when the new Indonesia Super League will start, recent suggestions are November, but Persib, as ever, are doing their planning early. Out go four of their five foreigners. Singaporean Noh Alam Shah, currently on a short loan with Tampines Rovers, Brazilian Marcio Souza, Aussie Robbie Gaspar and Miljan Radovic will have to find new clubs. Defender Herman Abanda is the only foreign player being kept on by Persib. New coach Jajang Nurjaman apparently has his eye on some replacements. Yeap, they're at it again. Indonesia can rarely organise friendles at the best of times and now is no different. Yesterday though they did manage a game and they won 1-0. What's that you say? You want to know their opponents? You can't find the game on FIFA website? Well, they played the Air Force! 1-0 against the Air Force. Singapore Eye League Cup Expansion? In more bad news for the few remaining fans of Singapore football officials have been so delighted not just with the League Cup but the Plate as well, for those poor buggers knocked out at the group stage, yep, gone are the days when an early exit from the unloved League Cup meant you could concentrate in the league. I understand from sources close to the Jalan Besar hierarchy, well Mabel, that the FA are considering tinkering yet further with the competition. The top two teams will then play off to decide who wins while the bottom two teams will likewise play off to decide the 3/4th place play off. In keeping with the domestic kitchen theme that runs through the League Cup, we have the Cup and the Plate, this new format will be called the Napkin. Mabel says officials are really excited about the new format and there was some talk that it could be introduced later this year but someone pointed out the calendar is already full. Undeterred, they will add the Napkin to next year’s competition schedule. One highly placed source says the plan fits in perfectly with the FA’s vision and 6 year strategic plan as the new format will increase attendances, some hoping that up to 20 fans may buy tickets for some games, and raise the profile of the game even higher. ‘We want Singapore to become known as a hub for innovation in football and League Cup 3.0 is proof of our determination to achieve that goal’ says one. Apparently one attendee talked about KPIs more than anyone else and won a free Happy Meal from a fast food chain. The Indonesia Super League is mumbling about starting up again in November. There was initially talk that a unified league would kick off in January but given the lack of progress on that particular front the ISL seems to want to go it alone placing it on another collision course with FIFA and the AFC. Of course had FIFA and the AFC shown any kind of leadership in the past, notably when the previous head of the PSSI was behind bars, then we may not be in this particular muddle. A muddle for sure but a different one. The people who run the ‘official’ league claim the idea of the ISL starting up in November is just a lack of communication. Apparently, so one guy was quoted as saying, the joint committee tasked with unifying the game behind one body and with one league, hasn’t met for a long time! Indonesian football continues to stick two fingers to the domestic stakeholders, players and fans, and the international bodies who are supposed to run the game according to agreed rules and regulations. The fact that the two parties haven’t met for a while speaks volumes about the desire in the game to sort the mess out. Towards the end of last season the players union threatened to go on strike. That was nothing but the meow of a paper tiger that, deep down, is reluctant to face down the people who run the game in the country. The suits control the finances and they have proven loathe to part with that cash no matter what a contract says. The remit of FIFA stops at Indonesia’s borders and until they, as the body responsible for the running of the game, take action nothing will change. I wonder why FIFA are so reluctant to take any kind of action? I was immensely tickled to read about some disturbances at a recent Thailand Premier League game between TOT and Bangkok Glass. Tickled because these are two of the corporate clubs that litter the football landscape in the country and, for me at least, I find it hard to get excited about a club that is just an extension of a corporate entity. The plastic water bottle throwing at the weekend, always the water bottles, excited me though. If fans of corporate clubs can get excited enough to lob bits of plastic at each other what else can they do? For most fans of real football clubs we have to make do with 90 minutes abuse, a walk through the back streets to the station after the game and a bit of banter at work in the Monday. But the corporate clubs? Imagine, for example, a fan of TOT who has a successful business. He may decide, if he loathed Bangkok Glass enough, to have the windows at his office smashed in then call Bangkok Glass for a quote. Not give them the work of course but just string them along, costing them time, effort and money with no hope of a return. Of course a Bangkok Glass fan could do similar. He could decide such was his visceral loathing for TOT football club he wants to find a new telecommunications provider. The options are endless in Thailand. If you get annoyed at BEC Tero then stop watching the TV channel that owns them. Fed up with the ref giving Muang Thong United all the 50/50s? Then stop using their cement! Pattaya United get a last minute winner against you? Visit Phuket next vacation. Unhappy with the antics of Police United players? Secretly video the next shakedown and post it on You Tube. Buriram United come from 7-0 down with two minutes on the clock to win 14-7? Move your factory and your friends’ factories to the north east and instruct your staff to vote for the other lot. Hate the hotel you have to stay in Chiang Mai when playing TTM? Stop smoking! SLeague champions Tampines Rovers have reac ted swiftly in the wake of their League Cup semi final loss against Geylang United. Coach Steven Tan has been shunted to the reserves while technical director Tay Peng Kee has been charged with the Stags title defence for the rest of the season. Officially no one is saying he has been sacked but when you are a pilot flying the plane then suddenly you are left serving the drinks it sure aint a promotion. Singapore football seems to like these 'reassignments'. Happened to Mike Wong at Geylang United a while back. It may work there where the football community is tiny and people do there best not to cause offence but would coaches in other countries accept it? When it comes to countries nutty about sport, few are nuttier than the Australians. Australia; where a horse race can bring the county to a standstill; where men in tight, very tight shorts chase an odd shaped ball are often cheered on by 70,000 nutty spectators; where two types of rugby are popular and they excel in both. Traditionally the different codes of football have had their own powerbase. 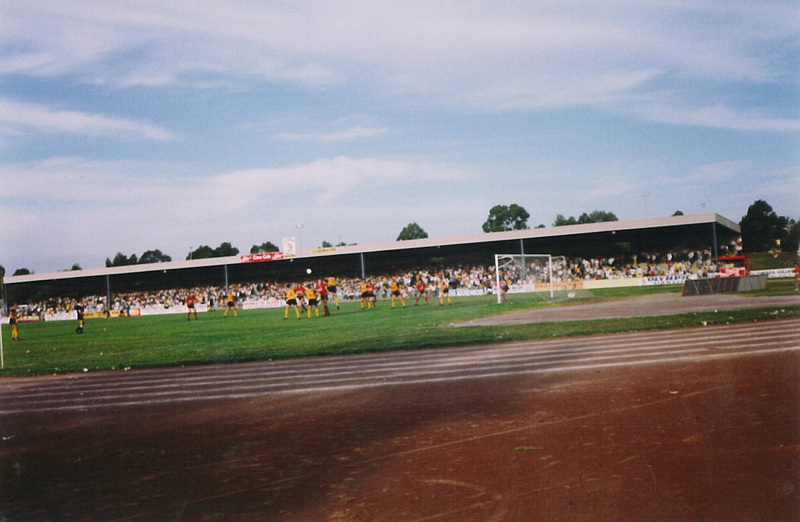 The Australian Football League grew up in Melbourne, for a long period of time it was known as the Vitoria Football League or VFL even after it made its first tentative moves away from its traditional base and across the country. The AFL ladder can still bear an uncanny resemblance to a Melbourne map. Clubs like Collingwood, Essendon, Carlton and St Kilda have a very definite supporter base that has built up over many decades of success or mid table oblivion. While some Melbourne based teams have fallen by the wayside, the code has flourished elsewhere with cities across the country represented in the national league. AFL, not having to answer to a tiresome world governing body, has developed its own way, it has taken the franchise system made popular in the USA, Sydney Swans started life as a Melbourne team, added the draft system o allow struggling clubs an equal opportunity of getting the best players while keeping the traditional rivalries and laddish culture that epitomizes sport in many European countries. To those not familiar the game may look like a mixture of basketball, ballet and rugby but for its aficionados, who pass their club down to the next generation there is no rival to the footy. Unfortunately football in Australia, the round ball sort enjoyed by just about every country in the world, has yet to have a similar impact domestically. For sure players like Harry Kewell and Tim Cahill have raised the profile of the game internationally but back home it remains a very poor cousin to AFL and the rugby codes. It’s not hard to see why. Rather than adopting the AFL model of applying US business sense to the European notion of identifying with your local team, they have fully embraced the American model. So when the league was started clubs set up shop round the country based on licenses issued by the FA. Teams were given names like Sydney or Brisbane Roar. Bland, US franchise style names that bore more resemblance to a video store or a fast food outlet selling fried chicken. As a football fan I would find it very difficult to get excited about a team called Perth Glory or Melbourne Heat. Essonden and Carlton in AFL, Heat and Victory in the A League? Ironically there was already in place a number of teams which boasted grassroots support. Teams like St George, Marconi and APIA Leichhardt in Sydney, South Melboure Hellas, Preston Makedonia and Heidleburg Alexandra in Melbourne were recognizable in the local community as local football clubs but they were never really embraced by their local communities. As the names suggest, there was a strong ethnic bias implicit within the football clubs. When Sydney Croatia met Melbourne Croatia the game was billed as the Croatian derby in the local media! Unfortunately the ethnic qualifier on the club name discouraged a wider fan base and those clubs that did try to break the mould were usually doomed to failure as the Aussie sporting public failed to respond to a game they derisorily called ‘wog ball’. The ethic based National Soccer League was never a long term proposition. Everyone knew it and everyone knew that clubs needed to appeal to the whole community and not just one sector of it. But while everyone knew this, no one wanted to be the first to blink. When a new football federation was set up they all but ignored the older, more established clubs. They wanted Australian football, buoyed by World Cup qualification and the success of exports overseas, to start from scratch. Out went the old with their history and traditions and in came the new following a template imposed from on high. The new teams are struggling. Beyond Melbourne Victory, crowds are small. Local businessmen have pretty much shunned the game; A League champions Brisbane Roar were bought out by an Indonesian group who are involved in several Indonesian clubs as well as a second division Belgian team. One club owner, so disgusted with the way the game is run, has threatened to set up a runaway league; another link with the island country to the north! Perhaps it is time for the A League to welcome the original clubs back into the fold? Outright identification with a particular ethnic group has no place in sport but there is nothing wrong in celebrating your roots. Europe and South America are littered with clubs whose name, kit or crest links back to non indigenous founding fathers. There surely can be no shame in having a team called South Melbourne, shorn of the Hellas suffix, wearing blue and white and featuring a Greek flag as part of their badge. But at the same time the clubs must be out there in their community telling people they belong to them and not just a certain sector. By bringing in teams like South Melbourne or Adelaide City, the A League could go a long way towards dispelling the notion that their product is as exciting and genuine as a league full of fried chicken franchises with similar products, uniforms and history. The league are hoping that the addition of a second team in Sydney, representing the populous western suburbs, can provide a kick start to the moribund game but doubts remain. All the while they ignore the crucial link a football club has with its community the game will continue to struggle in the shadow of the other codes that dominate the sports in the country. Not written anything for a few days so here is a quick wrap. Persebaya’s notorious support, known as Bonek, are in the news again. This time though the news isn’t about rioting fans or supporters falling off trains. Instead the news is positive. At a time when Indonesian football is just another synonym for disaster the fans of Persebaya Surabaya are being held up as a positive. Queens Park Rangers are not one of the biggest teams in England. They are not even one of the biggest in London. But they do now have a rich owner who happens to come from Malaysia and through that link the west London team have spent a week or so in South East Asia playing friendlies and raising their profile. The tour started in Sabah against a state select team that featured the likes of Robbie Gaspar, a familiar name in Indonesian football circles, Titus Bonai, an Indonesian striker who just signed for BEC Tero in Thailand and Baihakki Khaizan who had spells with Persija, Persib and Medan Chiefs. QPR won 5-0. From Sabah they flew from the giant island of Borneo to the Malay Peninsula for their second friendly against Malaysian champions Kelantan. The team from the north east of the country are known for their own passionate support but this game was played in Shah Alam, just outside Kuala Lumpur. QPR won 5-0. Next up was Surabaya and the Bonek. Rather like skinheads and hippies, ‘polite’ society recoil at the mere mention of the word. Thousands of teenage scamps, street kids and students clad in green sharing a middle finger to all authority, Bonek are like the boogey man. When they hit town the inhabitants shutter down for the duration. Their reputation, like skinheads, punks and hippies, proceeds them. They are deemed guilty by association. Once, when they played away to Persib Bandung, TV cameras showed their progress as they travelled by economy train across the island of Java. Repelled and fascinated at the same time, viewers found themselves watching speechless as the young fans filled the coaches of the train and clambered on the roof or clung on to the engine. The authorities, it seemed, were powerless to stop them. At various stations along the route local youths spilled out from their kampongs to throw rocks at the Persebaya fans despoiling their turf and of course the camera crews were there to beam it to their audience. Queens Park Rangers knew none of this of course. Joey Barton, the closest English football has to a Bonek, wasn’t on the trip, suspended after his behavior away to Manchester City when City won the Premier League. They were here to play a one off friendly, Surabaya was just the last game on the tour. An estimated 1,000 motorcyles followed the QPR team bus, and motorcycle outriders, out to the Bung Tomo Stadium. Inside the stadium 55,000 fans sang and chanted themselves hoarse. QPR had come to play football; they left blown away by the home team’s support. There were massive banners and flags, fireworks, choreographed displays. For one evening Persebaya’s fearsome Bonek had become Indonesia’s football ambassadors and the visitors were impressed, taking to the internet to tell everyone about the incredible evening they had just enjoyed in indonesia’s second city. Coming in the week that Everton and Galatasary pulled out of a trip to Indonesia to compete in the Java Cup, the Bonek at least ensured football in the country had regained some pride in the eyes of the world. COMMENT - this was written 25 July for the Jakarta Globe. No idea if they used it or not! Ever wondered why Malaysia keep winning trophies regionally? After playing Arsenal and Manchester City they will be sending a squad to Austria to climb some mountains and blow some alpenhorns. After being humiliated in their attempts tp host Everton and Galatasaray in the Java Cup, Indonesia is now going to try again. This time with the SCTV Cup. This is scheduled to take place in September and will feature Indonesia, Indonesia U22, Malaysia U22 and North Korea. The Indonesians do like to have a pop at the Malaysians for various childish things, they steal our culture blub blub, but fair play to the Malaysians, they are always up for a kick around. In the debacle of the Java Cup the Malaysians stuck around and played Indonesia in a behind closed doors friendly and no here they are jumping on another flight. As for North Korea, they would play my pub team if we invited them and offered to let them kip on our couches. This comes a few days after Indonesia are thought to be hosting Espanyol Reserves! English football is full of eccentricities. Every match day up and down the country there are people out there busy adding to their collection of match day programmes, badges or tickets. Others collect scarves, pennants or autographs. You name it and there is probably someone out there somewhere with a sizeable collection of them. I’m sure if some enterprising club introduced their own vomit bags, much like airlines do, complete with club crest on them some bright spark would soon be out there buying them up, getting a few autographed to add to their value then starting a website about his growing collection. All those nutters make the 92 Club seem somewhat staid and normal. The 92 refers to the number of football clubs there are in the top four divisions of English football; for new converts to English football there are a further three divisions outside the Premier League and that is how they manage to promote and relegate clubs. The aim of the 92 Club is to provide a place for members to gather and talk about their achievements. And to be a member you must have attended a competitive football match at each of the 92 stadiums in the leagues. Not just any old game. For example, my long trip to the South West of England to see Plymouth Argyle play Everton would not count because it was a friendly and the sniffy members don’t recognize such meaningless games. Once members have ‘done’ the 92 then they often go on and cover Scotland, Wales and Irelands or they start visiting as many ‘non league’ grounds as possible where they meet other ‘groundhoppers’ and opine about how this is real football and the modern game has lost its soul thanks to the millions of pounds flooding in. Could Indonesia host a similar club? Unlikely given that it would mean fans would have to travel from Banda Aceh at the northern most tip of Sumatra to the highlands of Wamena in Papua with all points in between. Logistically a nightmare, prohibitively expensive and that is before we try and track down a reliable fixture list! In England clubs have their own home stadium, most own them, and you can be sure when Rochdale have a home game it will be at Spotland. I have seen PSMS Medan play two home games but never in Medan! One was in Bandung, the other Jakarta yet they were home games. Their own stadium was closed for renovations at the time and they were forced to take to the highways and byways. What about Pelita Jaya? I have seen them play home games in three different cities; Purwakarta, Soreang and Karawang. Before that they played in Solo, Jakarta and Cilegon. How would any groundhopping club in Indonesia address that? Last week I saw PSIM Yogyakarta play Persebaya at the Mandala Krida Stadium in Yogyakarta. To all intents and purposes it was a PSIM home game. But the game was a play off and in the eyes of the authorities the stadium was a neutral venue; for them Persebaya were the ‘home’ team! We’ll round off with Persiram Raja Ampat. The notion of Raja Ampat glazes the eyes as we consider gorgeous, white sandy beaches and fabulous diving. I have been to three Persiram home games, one was cancelled at the last minute as the police on duty were called to a riot elsewhere. The games took place not way off to the east of Indonesia but in polluted South Jakarta. 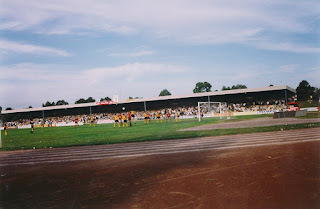 The idea of a groundhopping club is an intriguing one but we are a long way from that. Instead what we have is the occasional European who makes his way over here and tries to find as many games as possible to visit with the aid of Facebook. Yet the ones who have tried this have always returned home with some unbelievable stories about football in Indonesia and how friendly the people were once they had overcome their amazement at the foreigner who had tracked down an amateur game in Sragen! I bet you woke up this morning thinking what you really needed to know was the latest in the Singapore League Cup. Go on, don't be bashful. you know it;s true. I mean who needs the Olympics when you busting a gut to find out how Gombak United got on against Tampines as they meet for the zillionth time this year. We're at the quarter final stage and the second leg fixtures kick off today so now is as good a time as any for an update. Last year was a bit of a non event in Thai football. It had plainly been decided before a ball was even kicked in anger that the teams from a certain city would be allowed to win everything including American Idol and the Boat Race. For the rest it meant going through the motions. Yes, they were allowed to win games but, heaven forbid, not against the favoured teams from the favoured city. So you had serial champions Muang Thong United left hiring and firing coaches; they knew no matter who kept the job they were never going to be allowed to win the TPL, and they ended the season with Merseyside's largest landlord Robbie Fowler in the hot seat and playing at the same time. That's how daft things had gotten in the land of smiles. This year though, up till now at least, seems different. The two Burirams merged and seem to have decided to concentrate on the AFC Champions League leaving Muang Thong United a free run at the title. For now they are looking back on a run of four consecutive draws. Home games against TOT and Chainat should see the champions back to winning ways but you can never tell in this league. 19 games in to the season Muang Thong United, who do have an agreement with a company to use their name in the official club name for which they get juicily paid, are unbeaten and 14 points clear of the men from the north east. Chonburi were hot on their heels but two defeats in their last five games has seen a eight point gap develop between the two. Last year the events at the Thunderdome, there is an agreement with a company to use their name in the official stadium name for which they get juicily paid, resembled a pantomime with so many people occupying the hot seat no one would have been surprised had Widow Twankey replaced Fowler. This year they have been able to get on with the football. Eager foreign players have come in recognising an opportunity to kick start their career with the ambitious Thai club rather that washed up pros. The big three collide towards the end of August. Muang Thong United host the champions on 18 August in front of what should be a bumper crowd while a week later they head to the eastern seaboard to play Chonburi. The season is scheduled to end in October ahead of the AFF Cup but don't hold your breath. They like their fixture changes in Thailand as much as they like MBA speak in Singapore.